Leading Restaurant furniture distributor helps Calexico, CA coffee shop with its grand opening by supplying it with restaurant chairs and bar stools. Leading commercial furniture distributor, Restaurant Furniture.net recently teamed up with by supplying it with new commercial chairs and tables for their grand opening. Colca Cafe Shop features a variety of fast, affordable items. The menu includes burgers (such as the signature Third Street burger, topped with an egg and bacon), subs, wraps, sandwiches and salads. They also serve baskets of chicken wings, mozzarella sticks, boneless wings, onion rings and chicken and fries. For breakfast they serve biscuits and gravy, artisan breakfast sandwich, breakfast wraps and bacon, egg and cheese biscuits. The soups they offer are chicken noodle, tomato, chili and the soup of the day. The owner of the Colca Cafe needed high quality commercial seating that would look great and be able to withstand the high traffic that the deli experiences on a daily basis. “The owner needed sturdy, durable chairs that look great, but he didn’t want to spend a lot of money”, explained David M. He turned to Restaurant Furniture.net because of their reputation for premium quality and strong built furniture at affordable prices. Restaurant Furniture.net supplied the Third Street Food Court with high quality commercial chairs, bar stools and tables at competitive prices that fit well within his budget. The owner decided to go with Metal Coffee Cup Restaurant Chair and matching in black frame finish with padded seats upholstered in black vinyl. Customers have the option of a solid wood seat or an American made padded seat made of vinyl or fabric. Wood seats are available in 6 different finishes. The frame is available in black, copper vein, silver vein, gold vein or gold. The Metal Coffee Cup Restaurant Chair sell for $38. A matching Coffe Cup Metal Bar Stool is also available and sells for $56. For tables, he decided to go with reversible table tops in oak and walnut finish with a brown t-mold edge. The reversible table tops also come in mahogany and black finish with black t-mold edge. The table tops come in many shapes and sizes and prices start at only $21. “The reversible table tops are very popular with restaurants and pubs because of their versatility and low cost” said David M.
“The Metal Coffee Cup Restaurant Chair is very popular with coffee shops” remarked David. “They look are very durable and look great in cafes and coffee shops with their distinctive design”. 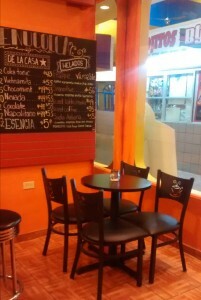 Colca Café is located at 115 Rockwood Ave. in Calexico, CA. They can be contacted at: (760) 759-3594.